A boy (Joey Steakley) makes a special, dusty friend. Odradek is one creepy, sad play. A pensive boy (Joey Steakly) is slowly falling into an emotional and physical downward spiral. His recently-divorced father (David Parkes) brings him to a doctor (Carolyn Defrin), who tries to determine what’s wrong with the boy, and the father and doctor begin sleeping with each other. 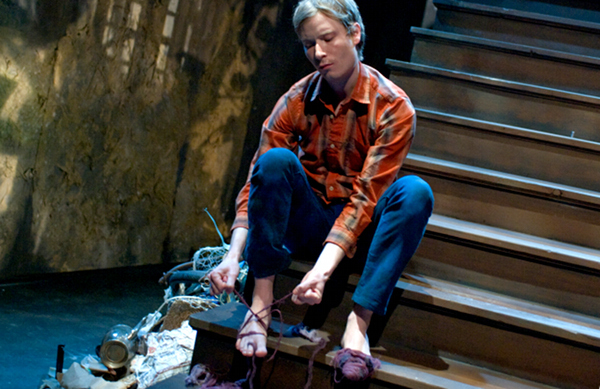 As the boy struggles to deal with this health and his parent’s divorce, he befriends a creature made of twine and rags under his stairs, finding an odd degree of solace. Playwright Brett Neveu based this 83-minute, one-act piece on the Franz Kafka short story “The Cares of a Family Man” and this painting, and it’s an intriguing and, at times, unsettling piece of theatre. Director Dexter Bullard maintains a consistently detached and despondent tone throughout the piece, making you wonder if the entire play is taking place in the boy’s mind. And Collette Pollard’s shadow-strewn set (shadows courtesy of lighting designer Lee Keenan), featuring one of the most impressive staircases I’ve seen on a stage, accompanied by Josh Schmidt’s eerie sound design, which includes minor chords scratched out by an on-stage double bassist (Ruben Gonzalez), casts an appropriately melancholy and atmospheric spell. This is some excellent design work. However, simply put, the show isn’t that exciting. It’s a curiosity and a head-scratcher, and while I certainly admire all the craft and care that went into drawing you me this macabre world, I didn’t find myself particularly invested in any of the characters — mostly because the detached tone of the play makes you wonder if any of it is reality. And there is surprisingly little tension. Aside from a jarring final moment, the piece just kind of plays out before you, and then ends how you would expect it to end. I’m just not quite sure what the point of it all is/was. So, if you’re looking for dynamic plot, don’t look here. However, if you want to see excellent stagecraft and be somewhat creeped out by eerie theatrical imagery, by all means, go! I completely see where you are coming with this. I found that I was engaged with the story in spite of the detached tone, but that’s more about my preference than anything. However, despite all the rest, this is one of the best set, light, and sound designs I’ve seen in a very long time. Yes, I think preference plays a big part. TimeOut gave it a very strong review, and after reading it, I could see why people would find this piece thrilling. It paints an emotional, atmospheric landscape, and some people eat that sh*t up. I couldn’t agree with you more. My favorite part of the show was when I walked in and saw the set. Except for a few awesomely theatrical bits (which really didn’t make sense but were cool nonetheless) I was bored and confused pretty much the whole time. Thanks for reading, Rhode, and commenting. Looking around me at last night’s audience, I got the sense they felt the same way as you. A lot of texting during the performance (annoying) and very tepid applause at the end. Next Post Do you want to dance like the Go-Go’s?